This week is Temple’s annual Homecoming Week. It should be a lot of fun! 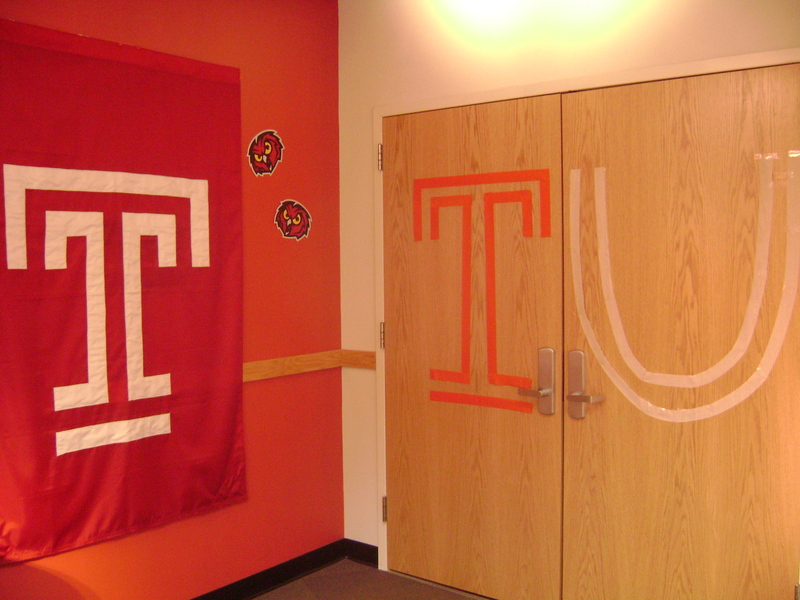 Each year, different offices all over campus decorate desks, lobbies, and walls with Temple stuff for a decoration contest. Last year, the Welcome Center (where I work) was a winner!! I always look forward to helping out because I love Temple and have tons of school spirit. Apparently the Homecoming concert this year features Lupe Fiasco and Asher Roth. I’m personally not going, but it sounds like it should be fun. I’m mostly excited for the Homecoming game on Saturday vs. Army! Temple Football is now 3-0 in the MAC!! GO OWLS!!! I have a video from this past weekend when the Diamond Marching Band played Sum 41’s Fat Lip at a nearby high school’s band show. We were just there as exhibition, but it was still cool to have lots of high schools see Temple’s band. Otherwise, not much else to report. Just super busy with classes and papers and homework and trying to have a social life, haha. I’m looking forward to Halloween though! I love dressing up as something crazy and going out with friends. I’ll keep you posted as to what my costume will be this year 🙂 more to come! I can’t believe I’m already a few weeks into my senior year of college! I remember starting as a freshman like it was yesterday. I also still can’t believe I’m in the US and not in France 😦 I’m starting to apply to grad school in just a couple of weeks — I am so excited! I’m trying to go to Middlebury, in Vermont, which is one of the best schools in the nation for foreign language. They are known for their intensive Language Pledge, in which students pledge to only speak the language they are studying for an intense 6 weeks. Students have the option to complete their M.A. several different ways — but the option I would like to do is the 6-week intensive program in Middlebury and then the academic year abroad in Paris (September-June). It has my name written all over it! More updates on that later. This semester I’m taking some pretty interesting classes. I love them all! I’m taking one of my final French classes, French Women’s and Francophone Writings. We’re reading 8 mini books and so far I like them! In Spanish, I’m taking Hispanic Readings and Conversational Review. Both of my professors are native speakers — which is a HUGE plus! One professor is from Argentina and the other is from Spain. Then for political science, I’m taking American Presidency and Politics of Identity, both very cool classes with very smart professors. And last but not least, to fulfill my last writing intensive requirement at Temple, I’m taking the popular Death and Dying class at the Center City campus, called TUCC. My first paper for it is due in 2 days on psychology. Overall though, I’m loving all of my classes! In other news, the next Temple home football game is this Saturday against Buffalo! We’re playing music from 1979 because Temple Football is inviting the 1979 bowl members back to watch the game, etc. We’re playing Earth, Wind, and Fire’s September, My Sharona, and then Styx’s Renegade. It should be pretty good! Our first show at the first game was an alternative-themed show. I believe we’re going back to the show for the game after next. We played Welcome to the Black Parade by My Chemical Romance, Can’t Stop by Maroon 5, and closed with Seven Nation Army by The White Stripes. When we return to the show next month, we’ll be adding on Fat Lip by Sum41. That’s all I’ve got for now. More updates to come!! I think the title says it best. This is Homecoming week here for Temple. One of my favorite times every year. There are all kinds of events every day of the week. For example, tomorrow Main Campus Program Board is coming around to judge all the offices of Temple that decorated their rooms with Temple stuff. We decorated the Welcome Center today and it is looking pretty good!! I’ll post pics at the end. Then the week finishes with our football game on Saturday at 2pm at Lincoln Financial Field. We’re playing Western Michigan so I’m hoping we’ll win (although DiMichele is out now..). 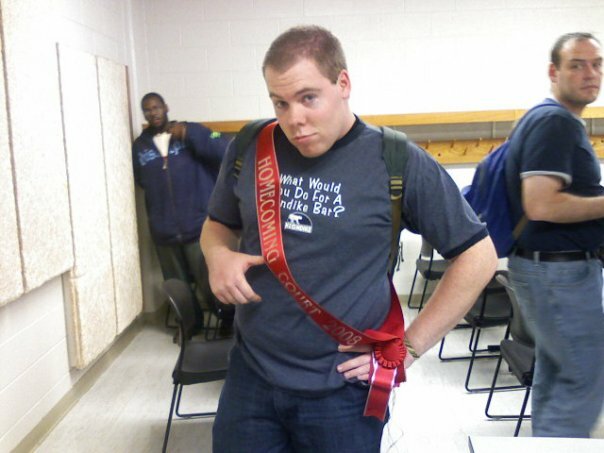 Anyway, it’s a very exciting time, and one of my good friends, Steve, is running for Homecoming King!! He already made the court and the voting starts tomorrow. I’m really hoping he gets it!! It will be a close race, but I’m keeping my fingers crossed. Besides that, I’ve been so busy with classes. I’m getting slammed with a lot of reading and tests/quizzes. Tomorrow I have my first Spanish test, and I’m pretty nervous about it! Lots of studyin’ to do. I’m gonna go start on that now, haha. More later!! Peace. The Welcome Center all decorated for Homecoming 2008! Uploaded from my cell phone in class. Steve Smith for Homecoming King! Ok so this is my first post on here. I’m kind of excited to start blogging again. I’ve missed it a lot. I figure I’ll write on here about things that go on in my head and what I do with my life, ha. First off, I’m a sophomore at Temple University in Philly. I love it and am really enjoying this time in my life. Today was my first day back to work after the holidays. I work in admissions at Temple so when they reopen, so do we. I guess it’s good to make some decent money since I’m not really doing anything else at this time. 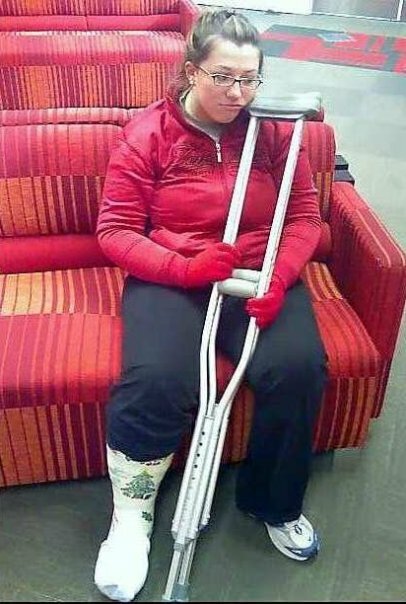 By the way, did I mention I have a broken right foot? Well, I do. I broke my 5th metatarsal while doing the “soulja boy” dance. No one else I know has ever done this. Only I would do something like that, and everyone knows it 🙂 I’ve been getting by okay so far. I have a doctor’s appointment this week that will foretell my fate for the next few weeks (or even months for that matter). 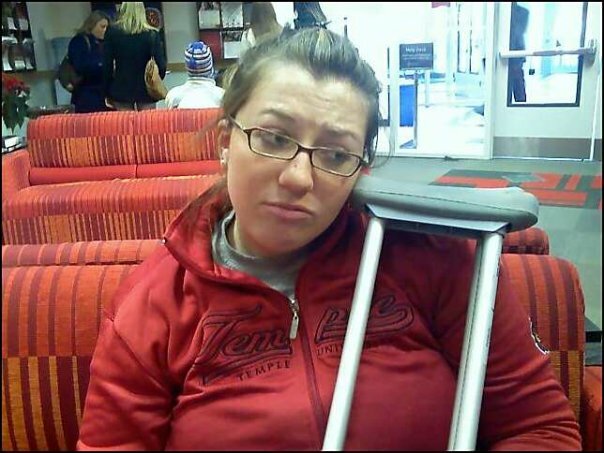 I’ll probably end up in another cast with crutches, or worst case scenario, have surgery. Let’s cross our fingers for the former, heh. So that’s pretty much me for the time being. The holidays were definitely well spent for me. I had all my family come over my house for Christmas dinner. We decided to do an Italian dinner, well, I guess because we’re all Italian. Complete with the antipasto, Italian sausage, lasagna, ham, turkey, mash, potato salad, and even the cannolis. It was a great time. It’s so nice to see my family get together like that during the holidays. It isn’t very often we get together, the whole lot of us. Pretty much for funerals or holidays. I think we hit around 15 people for Christmas, which is actually pretty decent. I decided to ring in the New Year at Temple this year. It was a lot of fun! Ashley, my bff and roommate, and I, decided to come back up here. Her friend from Delaware, Denise, came up as well. It was such a good time. We made a great dinner then headed to our friend’s boyfriend’s apartment, where we stayed until 2ish. Afterward, we came back home to our apartment, watched most of Anchorman, and passed out. Definitely a fun night. We all enjoyed ourselves. Well, that pretty much sums up everything as of now. More to come later..